Advertiser.ie - NUIG professor to ask Did Darwin Solve it All? 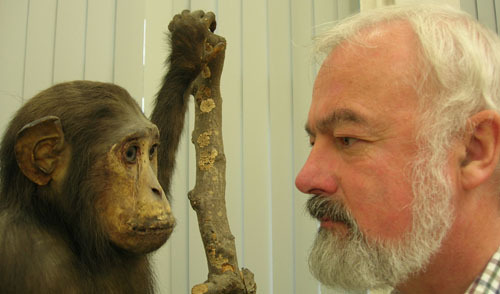 Professor Arthur and a human’s nearest animal relative at the Martin Ryan Institute Museum, NUI Galway. Charles Darwin made an immense contribution to science and to our understanding of ourselves as human beings when he put forward his theory of evolution exactly 150 years ago. The theory was first published in 1859 in Darwin’s great book On The Origin Of The Species, and despite ruffling some feathers in Victorian England, the theory was soon widely accepted by the public and scientists. However all scientific theories go through changes, revisions, tests, and improvements. In short, they evolve. Yet the theory of evolution has acquired the status of a sacred object among some biologists who are loathe to contemplate any idea that the theory, now 150 years old, may need improvements and revision, and that there are still gaps which scientists must work to solve. However, many biologists do not agree with Prof Dawkins, and NUI Galway’s professor of zoology Wallace Arthur is one of them and he will explain why at a public lecture in the university next week. Professor Arthur’s public talk, Did Darwin Solve it all? – Evolution 150 years on, will be delivered in the Martin Ryan Institute, NUIG, on Tuesday November 24 at 7.30pm. In his talk, he will explain why he feels that current research into evolution is doing much more than ‘adding footnotes’ to Darwin’s work. Refreshments will be served. Those interested in attending should contact Anne Quinn, Zoology, Martin Ryan Institute, NUIG, on 091 - 492323.